Our week in Chiang Mai flew by. We only had two days to really relax and just enjoy the city. One day after a yummy “French-Thai” lunch (and an awesome pomelo salad! ), we walked the streets of the neighborhood. 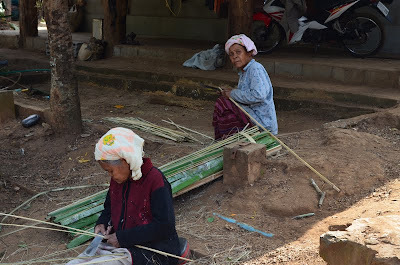 We headed straight for the huge local markets we saw along the Ping river when we were returning from Chiang Dao. On the map it is called Worarot Market – it was nearly void of tourists. 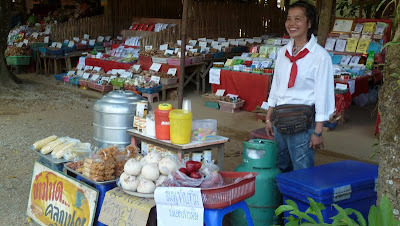 This is where the locals come to shop – as most items for sale were practical day to day goods. 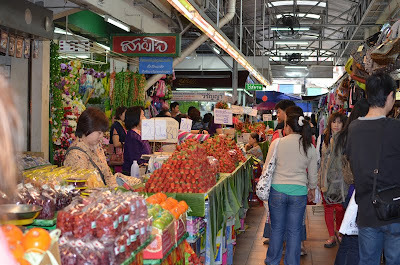 The market’s main building, which is over 100 years old is three stories tall. The first story is all food: meats, fish, vegetables – from fresh to dried, preserved, and packaged. The second floor was filled with clothing and fabrics, and the top floor looked to be toys, furniture and more clothes (we actually never made it up there). The “market” however, is not just confined to that building. All the adjoining streets and buildings house more shops containing all sorts of items for sale: Electronics, kitchen goods, sewing repair shops, tools, jewelry, shoes, etc. It’s a maze with little alley walls and halls leading everywhere. I’m pretty sure only a local resident could find the same shop twice around here. Just when we thought we were out, we quickly realized we were in the flower market. Adjacent to that was a “food court” and the butcher shop…are you getting the picture? Finally we did find our way out and ended up at the Chinese Shrine, Pong Thao Kong. 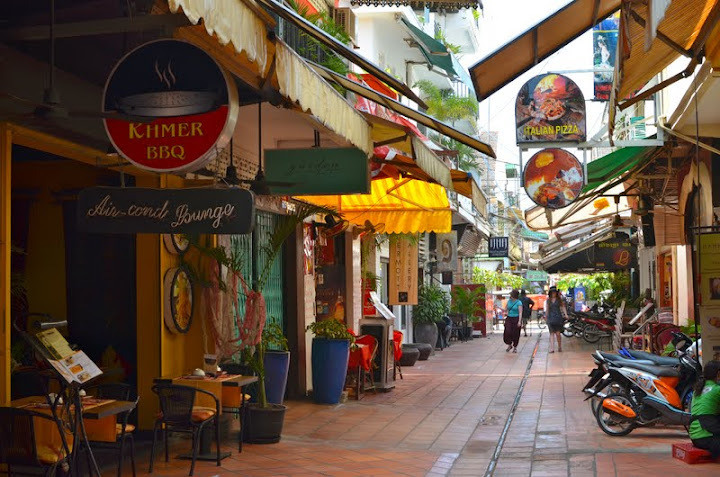 Here I read, that this section of the city is where the largest number of Chinese settlers took up residence and started their businesses, so the whole area is also referred to as the China Town of Chiang Mai. This whole area was so interesting, we decided to plant ourselves atop a foot bridge nearby and hang out for a while. It was fun watching the vibrant city below us and the everyday activity of it’s people. On our last day in Chiang Mai, we hired a driver for half a day and went up the mountain 8 miles west of the city to to see Wat Doi Suthep. A wat that was built because a white elephant caring the magical self-replicating buddha statue came up here, trumpeted, turned around three times and died. Personally, I think they built it here for the view. From up here you can also see the whole city of Chiang Mai (which is best right before sunset). We went mid-morning, so the view was still mostly obstructed by morning rays and haze. The mountain also has waterfalls, trails, birds, and the king’s palace (which if we had more time I’d come back to explore). 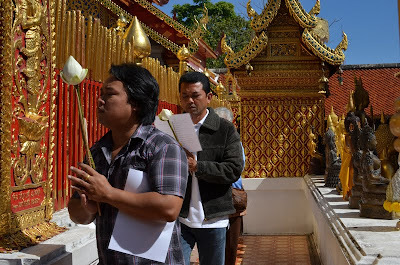 Despite the excessive number of visitors, the wat really is worth seeing. It’s packed with tourists. Vendors are lined up all along the streets right to the base of the stairs. There are tour buses and cars everywhere. I felt like I was at Disneyland. Fortunately our taxi driver knew a great spot to park not far from the entrance and we managed to avoid most of the mayhem. We spent nearly 2 hours here, so obviously there is a lot worth seeing. The stairs up are pretty cool. The railing on both sides is a long green undulating serpent dragon with four serpent dragons coming out of it’s mouth. Local mother’s come here with their young children dressed up in traditional dress who will take their picture with you (hoping for a tip). When you get to the top, it’s a double bonus. The outside courtyard is wide open and beautiful…almost worth an hour itself. 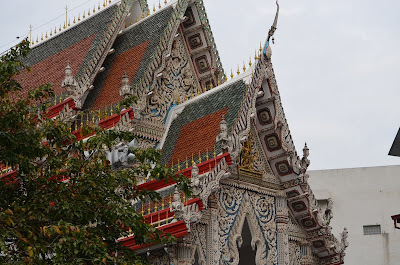 The inside is a different world (and totally worth the 30 baht ($1) entrance fee) – ornate and loaded with religious artifacts. 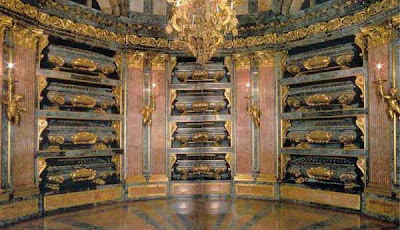 The gold plated chedi, the murals, the emerald buddhas, and religious relics of all sorts. There is an amazing number of intensely devout subjects who come here despite all the tourists taking pictures. How they managed to block us all out, amazed me. 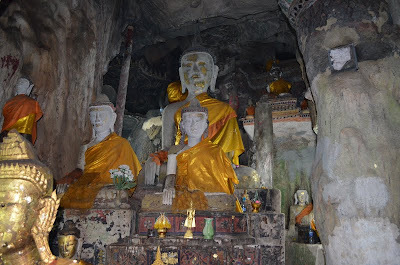 Our last stop was Wat Suan Dok. 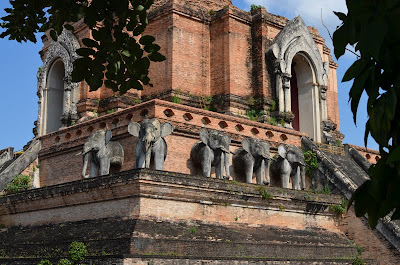 This is the wat where the famous white elephant (mentioned above) started it’s journey. From these grounds you can easily see Wat Doi Suthep up in mountain. 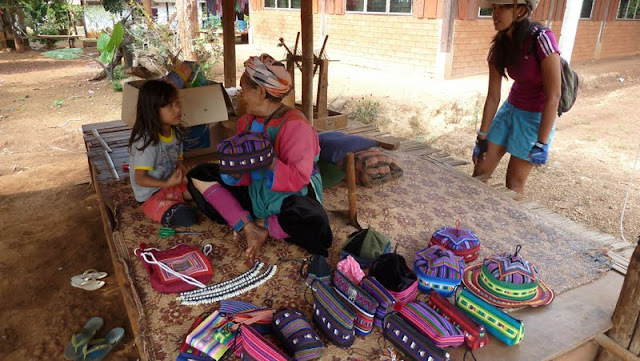 The name Suan Dok roughly translates to “Field of Flowers” – how nice is that? We really enjoyed this place. There were only a handful of tourists, lots of monks, and it was so different from the others. It had a huge, long prayer hall that I couldn’t even fit in my camera lens. Instead of the prayer hall being enclosed, it was open on all sides so it didn’t feel confining or too formal. 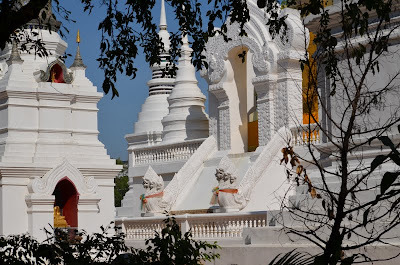 Next door to the hall was a huge burial ground – a forest of white reliquaries….containing the remains of Chiang Mai’s past rulers/leaders (the national royal burial grounds!). The whole place is also very photogenic as well. But, the absolute best thing about this place, was the little restaurant hidden just off the grounds. 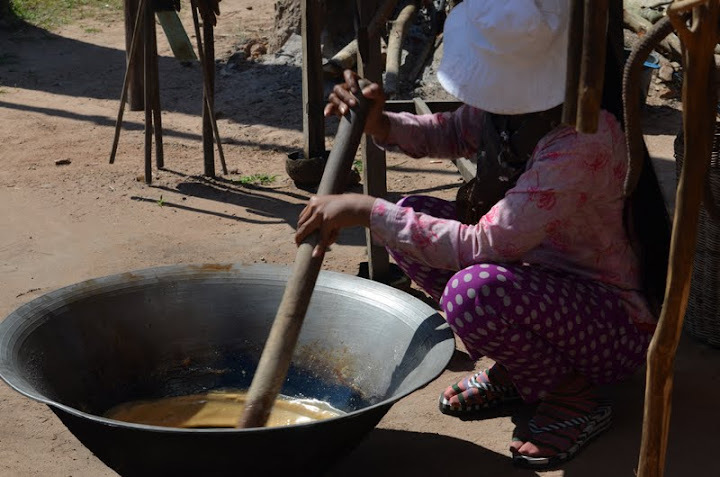 Our cooking instructor mentioned it, and I had seen it mentioned in a couple other local blogs, so I was hell bent on finding this gem – and fortunately we did. Pun Pun was, without a doubt, the best place we ate in Thailand. It’s all organic yet incredibly inexpensive. 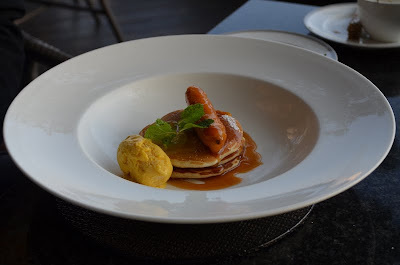 The presentation of the food is impeccable, the service friendly and relaxed, the atmosphere casual and fun, and the food was mouthwatering fresh and flavorful. I hope this place is still here when we return. 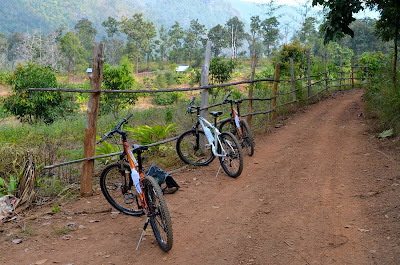 We had an absolutely amazing time in Chiang Mai, and we really weren’t ready to leave. It’s easy to understand why there are so many repeat visitors. We barely scratched the surface of everything there is to do here. We’ll definitely come back here someday. 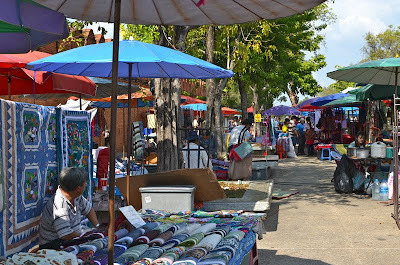 Sunday we decided to spend the day in the Old City of Chiang Mai. 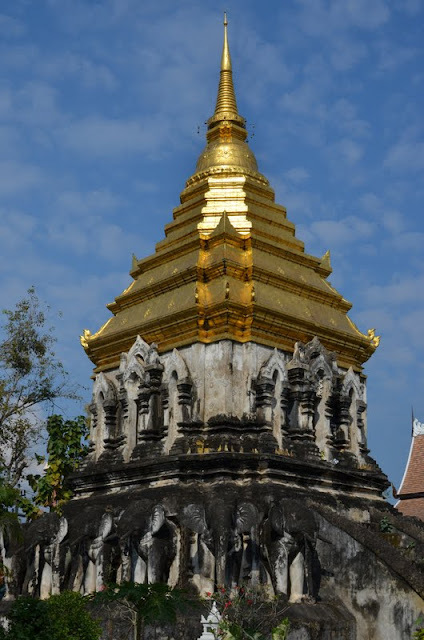 The whole city of Chiang Mai has some 300+ Wats (temples), and we wanted to see some of the oldest and most popular ones. We were a little sore from biking, so we figured walking would be a great way to loosen up our muscles. We did take our time getting ready and enjoying another delicious breakfast though (this time I had the French toast with Strawberry cream – yum!). We then slapped on the sunscreen and headed out. All we had for navigating the town was a small map from the concierge. There wasn’t much detail on it, so hopefully we’d be able to find all the places we intended to visit. Very early on in the day we ran into a postman who was really excited to see us. He wouldn’t stop talking about everything to see in his city. He asked for my map and he highlighted the “must do’s” (which we already planned). He also warned us not to go to any tailors. We thanked him and moved on. There were wats every couple of blocks on the main street into the city and we kept getting side tracked because each one is so interesting. One we visited had a Donald Duck statue in it and a woman trying to sell us caged birds so we could set them free. Chiang Mai was full of bizarre little things like that. We eventually made it to the East Gate. The East Gate (Thapae) is the main gate into the old city. The old city is over 700 years old, and was once entirely surrounded by brick walls and surrounded by a moat. In the middle of each walled side was a gate. Parts of the wall still remain, and so does the entire moat (which is now like a park surrounding the Old City). It’s fun to imagine what it must have been like before this big city surrounded it. When we got inside, I almost wish we didn’t have a plan, because there were shops, cafes, restaurants, cooking schools, little alleys, and all sorts of other wonderful distractions we could have spent days exploring – oh well, maybe another time. The first Wat we wanted to find was Wat Chiang Man, the oldest temple in Chiang Mai (built around 1270). It served as a camp for the King while they built the city. The wat’s grounds were pleasantly quiet and uncrowded…it felt more like a little community park. The structures weren’t overly ornate and the buildings were simple and not very big. The best part was the “elephant chedi” which was in the very center. The base was constructed with the front halves of full size elephant statues all the way around. And the murals inside the wihan (shrine hall) were also very attractive. We saw lots of dogs and cats wondering around the grounds here as well – and people reading. 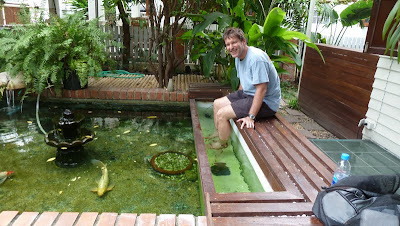 We tried to sneak out of this complex to avoid the tuk tuk driver who caught us when we first came in. He begged us to let him take us to the wats in town, even though we told him we wanted to walk. After a few minutes we just left, telling him we’d meet him later (which we never did). We continued on our way through the old city to the North Gate (Puerk) – probably the most attractive entrance into the old city. It had a set of topiary elephants to great everyone and fountains in the moats. We then headed back to the city center. We stopped briefly at the square in the center of the city where the Monument of the 3 Kings stands (it is devoted to the 3 Kings that were responsible for building the city). 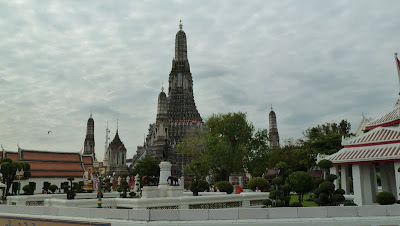 We took a right down the main street to the west side and Wat Phra Singh. This wat was like the “wat cathedral” – it’s a very large complex, with lots of big buildings and it was very busy. 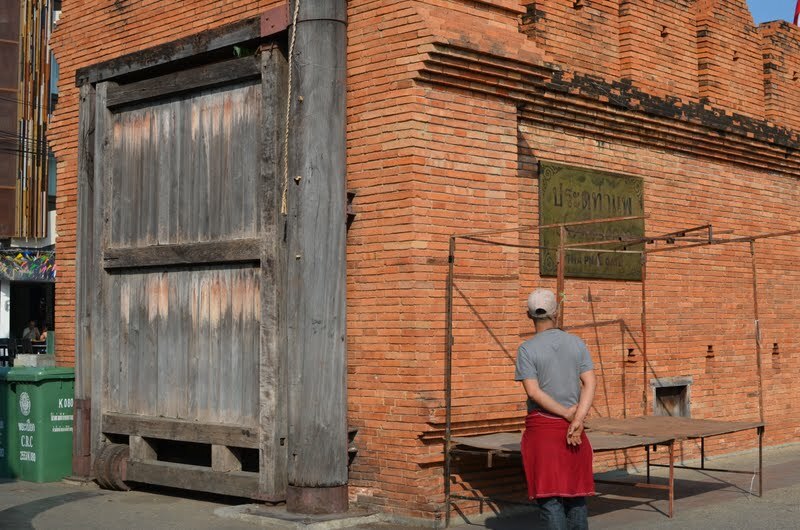 It’s one of the largest wats in Chiang Mai and it’s been restored several times. 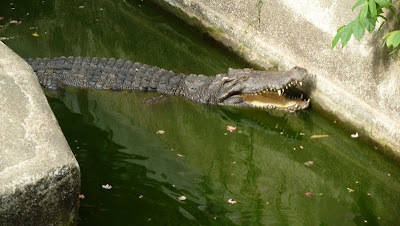 While impressive in it’s size, it lacked in personality. The highlight of this complex was Ho Trai (the temple library) and Wihan Lai Kham – because of their classic Lanna style architecture and the building details both inside and out. After a short break, we headed toward the West Gate (Suan Dok). We walked all the way along the moat until we got to the South Wall. As soon as we could see the southern gate we slowly made our way back into the city center. We only got side tracked once (a small local wat – which was a good find). The last wat on our list, Wat Luang was next. Even though it was a large wat, it wasn’t busy. We went inside and checked out the towering gold buddha and his extravagant alter and then headed out the side. Expecting to see similar buildings as before, we weren’t prepared for the huge, beautiful, old and damaged chedi standing in front of us…what a sight! Guess we managed to save the best for last. 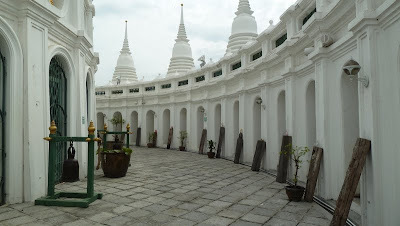 The courtyard around this chedi was the main focal point of Wat Luang. We spent a lot of time slowly going around it, relaxing on the benches in the shade admiring it’s size and details (it use to be 270 feet tall – and is slowly being restored). There was also a huge tree near the small but very intricate city pillar. Legend has it that as long as this tree stands, Chiang Mai will be protected. By 2pm, it was getting warm, and we were getting tired, so we relaxed a bit before heading back to our hotel for a quick siesta. On the way back to the hotel, we noticed they were already setting up for tonight and we could tell it was going to be huge. The famous Sunday market was tonight, and we were not going to miss it. I’m glad we had a couple hours to rest up before it started. We were told to get there early – to beat the crowds. We got there about 5pm. The traffic was horrendous – we almost couldn’t get across the street. The market was huge. It actually started several blocks outside the Gate…and then went on for nearly a kilometer on the inside. It branched off down side streets and into the wats. There were food courts, areas set up for foot message, areas for entertainment. And the variety of arts and crafts for sale was incredible. You have to see all the pictures to believe it. All the food looked awesome…we snacked on a few things while we walked through it all. We tried a soft chicken taco (thai style), some homemade vanilla ice cream, and of course, the pad thai.